On Sunday I went to a local fair. Walking through the entrance, a cornucopia of carnival before me, the familiar ferris wheel pinnacling the midway...I felt a wave of deja vu come over me. Not deja vu of former events in my life, but historical, like the deja vu of an earlier America. And then I ate a barbecue pork sandwich and a foot-long eclair that would certainly offend even the most open-minded of the French. But if not to eat fried fatty meat and cream, why does one go to the fair? Why to ride the rides, of course. Or, as I like to say, to practice not vomiting while trying to remember why you thought getting on something called the Tilt 'n Swirl was a good plan after eating the aforementioned cheesy sandwich. And furthermore, why you paid $5 to do this to yourself. Honestly, I've never been a huge fan of carnival rides, but not until recently did I come to appreciate the freakishness of the fair scene. Granted there were no freak show tents, not even a clown, creepy or otherwise, to be seen, but the aura of the freak show lives on under striped tent tops where carnies still tempt walkers-by with promises of huge blow up alien dolls if you can toss a golf ball into a dixie cup. But I wasn't tempted till the wax dip hand molds booth. 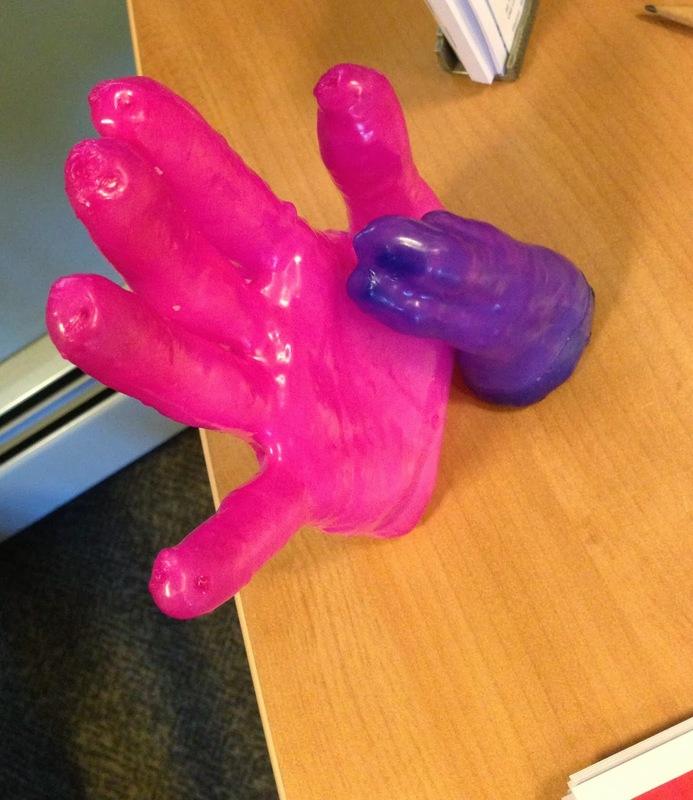 Dip my hand in wax to make an almost instant mold? I had to do it. But dipping my right hand wasn't odd enough for my tastes--Finneas was going under. The hot wax tender wasn't sure about getting Finneas into the wax without accidentally waxing my head too, but I hadn't come this far to walk away without an empty wax hand mold. So down I went. A casual observer might have surmised that I was attempting to hot wax my entire arm and shoulder--and even now I'm wondering why I didn't just jump into the barrel for a cheap leg waxing. But in the end I came away with a little wax Finneas replica and, because I mentioned it would feel left out, the woman let me wax mold my other hand for a 20% discount. I chose purple and pink to color the wax...I don't know why. After observing my wax hands sitting on my bedroom windowsill for a day, trying to evaluate why I thought I needed them so badly and not coming up with an answer, I set them on the desk of my instructor training mentor as a token of my appreciation. It caused a bit of a stir in the office (which made the entire venture well worth it for me), but there they sit to this very day. I love the fairs too. I love the feeling of returning to Old New England. I cannot go to one without remembering a camel ride at a fair in Vermont many years ago, riding remarkably close to my high school girlfriend in front of her astonished parents. I love the story of the wax hands. What a great idea! �� Yes, connection to eras gone by, like sledding! I also thought this was hysterical!